The Hanmer Valley Shopping Centre is proud to do whatever we can to be of assistance to schools, churches, organizations and community groups of all kinds. We feel it is important for us to be actively involved in our community, not just as a retail centre, but moreover as a responsible corporate citizen. The descriptions that follow over the next two pages will give you a good idea of how we are meeting our citizenship objectives as a mall. Mall Walking is growing in popularity by leaps and bounds. Where else can you walk up to eight kilometers in an hour, enjoying friendly conversation with your spouse or friends, listening to the lively music being played over the mall public address system and then follow it all up with a relaxing cup of coffee, juice or even a full healthy breakfast? Walking is becoming recognized by fitness experts as one of the best forms of exercise which can be enjoyed in groups or simply by yourself. The Mall Walkers at the Hanmer Valley Shopping Centre love the atmosphere and will all tell you that this is one of the best places to get in that hour or more of daily exercise. As a matter of fact, there are many regulars in our Mall Walking Club who come at different times of the day to do their walking. Some prefer the quiet in the morning and others enjoy walking among the crowds and seeing the activity once the stores are open for the day. Whatever your preference, we invite you to work the Hanmer Valley Shopping Centre into your fitness routine this winter. Now you don’t have to let the cold and snow put a hold on your health. Drive over to the mall and walk for an hour or two in climate controlled comfort. Take a break whenever you want in one of our comfortable sitting areas and have some refreshments from time to time. This could be the year when you actually keep those New Year Resolutions. Weekdays 7:30 a.m. to 9:00 p.m.
Saturdays 7:30 a.m. to 5:30 p.m.
Sundays 10:00 a.m. to 5:00 p.m. 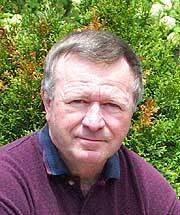 I think a word of thanks should be given to Val Mazzuca for the opportunity to exercise in the mall. Val has always given to people in need. His shopping centre is also a credit for shopping and the rest areas make it nice to sit and catch up on news which people pass along while they can rest and talk with their friends. On behalf of the entire community I would like to express our appreciation to Val for the many ways he makes it a pleasure to go to the Hanmer Valley Shopping Centre. Thank you, Val. The Hanmer Valley Shopping Centre is truly a community centre in all aspects of the word. It is one of the top indoor shopping centres in the City of Greater Sudbury. We have a wide variety of merchants and professionals who provide local residents with all of the goods and services they will ever need. And, most of all, we are always willing to lend a helping hand to groups and organizations who need to use our facilities to increase public awareness about their particular activities. 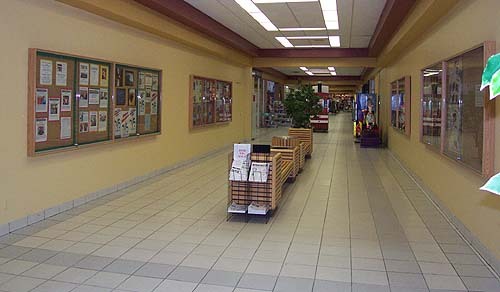 Working towards our common goals of enhancing the quality of life in Valley East and Capreol, I am pleased to extend a special invitation to all groups, organizations, schools, churches, etc., to allow us to post appropriate information for you on the special community bulletin board space that is now available in the mall. There are 256 square feet of bulletin board under glass and locked for security. All you have to do to have information about your group or activity is bring the material to the Mall Office (just past the hallway section) and leave it for Robert Kirwan. The material will be posted until the end of your event. This is an excellent way to let the general public know about your organization and to give recognition to your fellow volunteers. Many people recognize the value of these bulletin boards in keeping up with the events and activities that are around town. As a result, they make it a point to visit the bulletin board area every time they are in the mall. We look forward to helping your group in the months to come. The Hanmer Valley Shopping Centre is truly a community centre in all aspects of the word. It is one of the top two or three indoor shopping centres in the City of Greater Sudbury. We have a wide variety of merchants and professionals who provide local residents with all of the goods and services they will ever need. And, most of all, we are always willing to lend a helping hand to groups and organizations who need to use our facilities for fund-raising or public awareness campaigns. We have provided assistance to Church groups, schools, sports teams, service groups, etc. Our goal is to have some sort of activity or event going on every week at the Hanmer Valley Shopping Centre so that local residents will make it a point to stop by and check us out. The more successful we are at achieving this goal, the more successful groups and organizations will be when they set up and sponsor their events during the coming year. We are particularly interested in speaking to groups which are interested in hosting events such as penny sales; raffles; bake sales; or simply hobby displays to encourage people to join your organizations. If you feel you would like to benefit from the thousands of people who come through the mall every week, simply call 969-7215 and ask to speak to Robert Kirwan, the Manager of Marketing & Public Relations for the Hanmer Valley Shopping Centre. 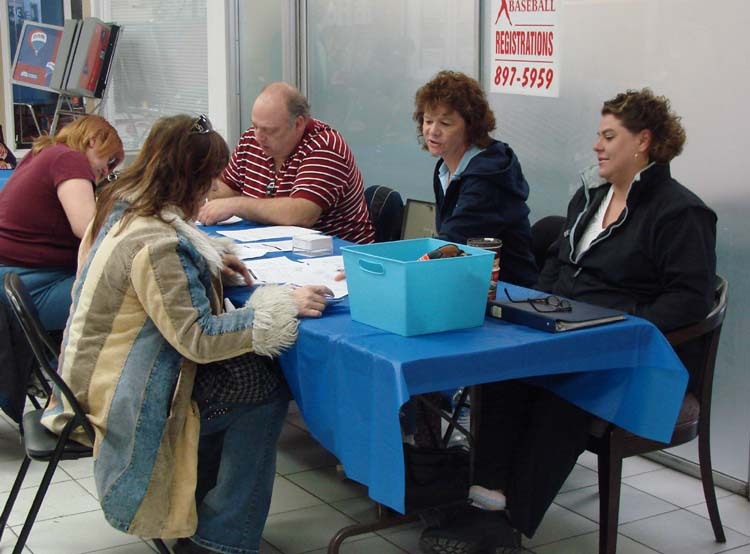 The Kin Club of Valley East held a Yellow Brick Road fund raiser to raise awareness and money for the Canadian Cystic Fibrosis Foundation on Saturday, April 18, 2009 at the Hanmer Valley Shopping Centre. Coordinator, Manon Bolger, shown 2nd from the right in the photo, is a Service Director with the District C.F. Foundation as well as a member of the Kin Club of Valley East. In addition to Manon, District C.F. & Service Director Randy Cruickshank from Newcastle , Ontario and Deputy Governor Kathy Alexander from Keswick , Ontario came up to spend the day with the group and help out. According to Manon the event turned out to be huge success. 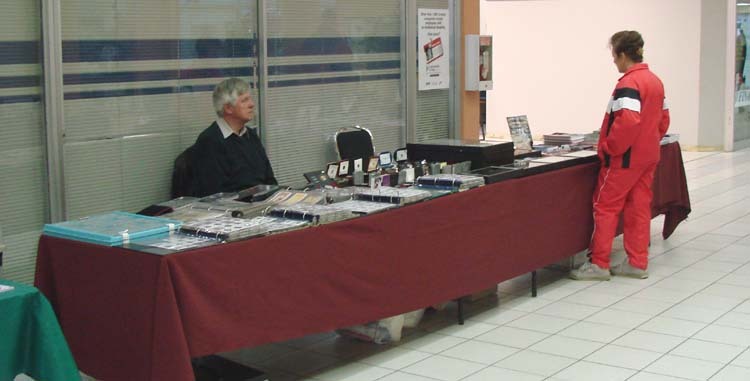 Three tables were set up in the mall, one for the selling of the foot prints, one with Cystic Fibrosis awareness materials and one representing the Kinsmen & Kinette Clubs of Canada as the District Membership Director with information on the organization. The one day event raised $817.92 for Cystic Fibrosis with the sale of the foot prints and silent auction. The picture for the silent action, which is shown in the group photo, was donated to us by ALL INK located in the Hanmer Valley Shopping Centre and the winner was Jean Proulx of Kapuskasing! 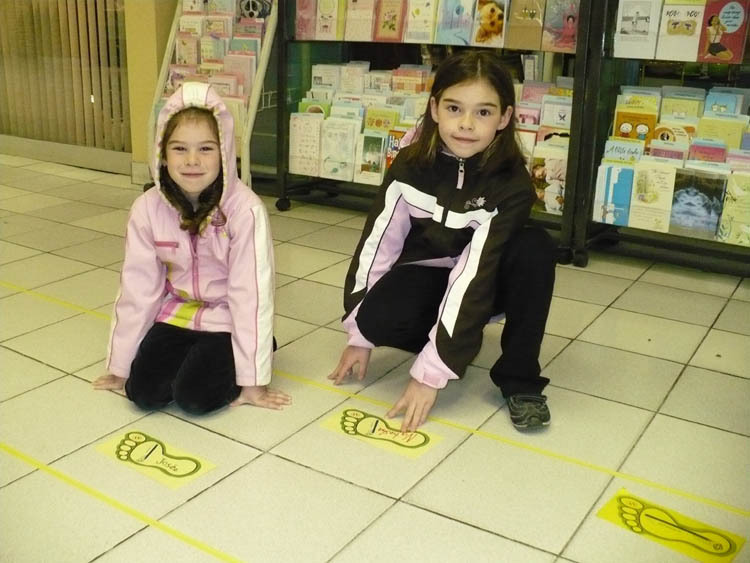 Josee and Natasha Trottier are shown in the photo below planning their foot prints on the floor in the mall. The 1st Valley East Scouts were out in full force during the Annual Apple Day fund-raising drive for this popular youth organization. 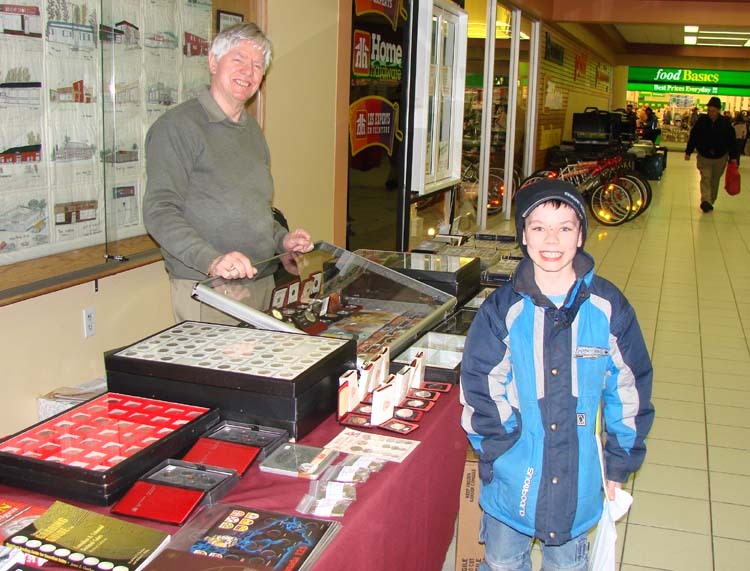 Here they are shown at their station in the Hanmer Valley Shopping Centre on Thanksgiving Saturday. Kneeling in the front is Cub Leader, Enrico Casati. 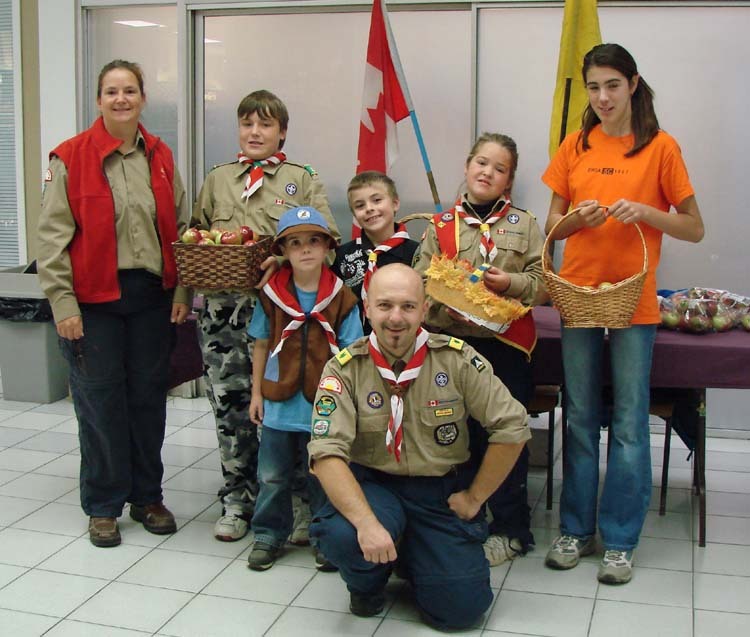 Standing behind him are Karen Luoma (Cub Leader); Justin Vautour (Scout); Bradley Pailing (Beaver); Zach Thorne (Cub); Emily Vautour (Cub) and Deanna Bourdeau (Scout). There are about 40 young boys and girls in the 1st Valley East Scout group this year. They meet from September to May at Ecole Secondaire Hanmer every Tuesday from 6:30 to 8:00 p.m. where they take part in numerous skill- and character-building activities. If you are interested in registering your child, or if you would like to find out more about becoming a leader, you can contact Debbie Christianson at 969-7095. 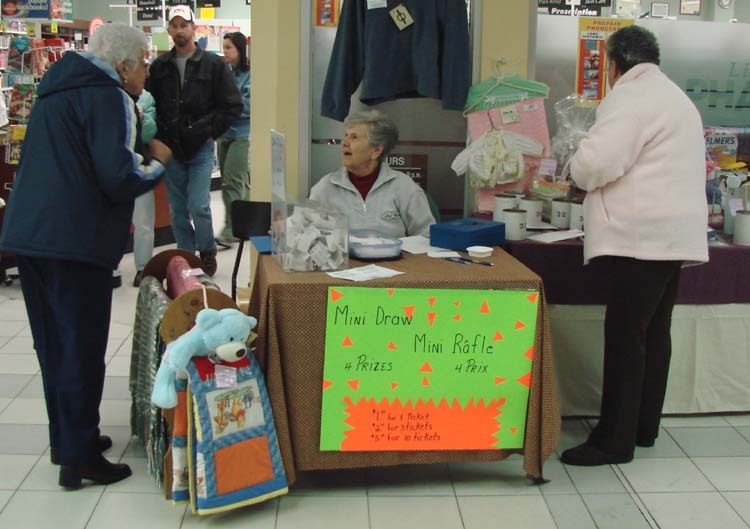 The Hanmer Valley Shopping Centre has become a popular location for fund-raising activities conducted by local groups and organizations. We provide our outside space as well as our indoor facilities for these purposes free of charge. Local community groups and organizations are welcome to take advantage of the warm summer weekends to raise some extra cash by sponsoring car washes on the property beside the Hanmer Valley Shopping Centre. There is no charge to the group for this service. All you have to provide is the material, the hose and the labour. The most popular day for car washes is Saturday, so if your group is interested in booking one or two weekends during the summer, it is suggested that you call 969-7215 and book well in advance. 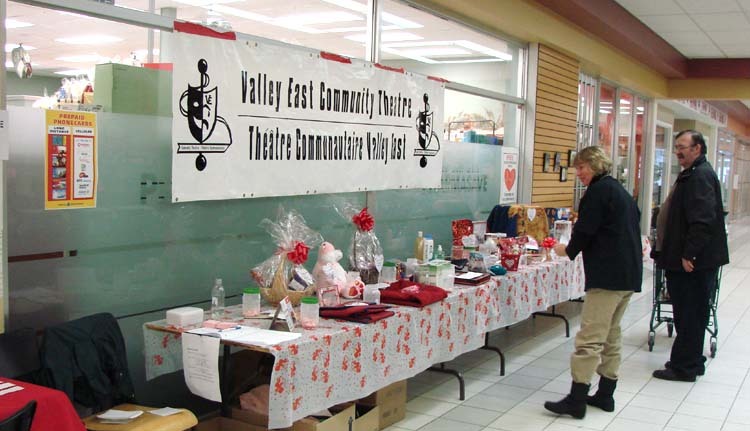 Sandra Desjardins, Secretary of the Valley East Community Theatre, puts the finishing touches to the Annual Valentine's Penny Table at the Hanmer Valley Shopping Centre on February 8. Each year at this time the group organizes a huge penny table sale to help raise much-needed funds for the theatre group. 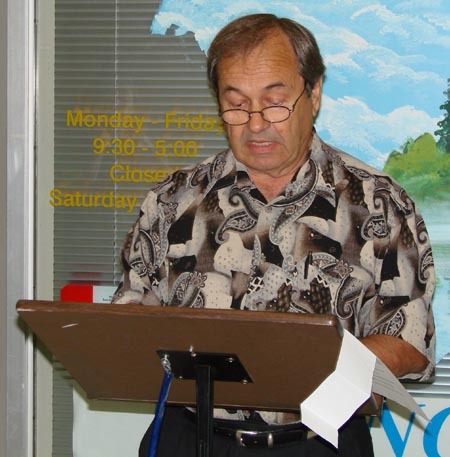 Shown examining the array of prizes is Marcel Legault, a trustee with the French Catholic School Board and someone who has always had an interest in the development of young artistic talent. The next performance by the Valley East Community Theatre will be popular musical, "Leader of The Pack". It will be held on April 24, 25, 26 and May 1, 2, 3, 8, 9, and 10. Each show will begin at 7 p.m. at Hanmer Secondary School. Tickets are $15 for adults and $10 for seniors and children. You can pick up your tickets at M & R Grill (Capreol), Valley Plaza Pharmasave; Paulette's Variety; Val Caron Rexall Drug Store; and Caisse Populaire St-Jacques de Hanmer. Giselle Charette wanted to do something different this spring to help raise money for Circle Missionnaire de la Vallee. So she discussed an idea with several of her co-volunteers at Circle Missionnaire and before long she found herself in charge of a penny table, raffle and silent auction on the weekend of April 12, 13 and 14. Indeed, the group has already booked their spot for 2009 and will return the weekend after Easter, April 17 to 19, 2009 . CERCLE MISSIONNAIRE de la VALLEE is an organization that was created in the early 1990’s to provide assistance to Sister Therese Lamoreux m.c.r. of the order of the Missionary of Christ the King. Sister Therese was originally from Chelmsford . When Sister Therese set up a mission at Sigueneau , Haiti , she discovered a tremendous degree of poverty and hopelessness among the people. Thus, Georgette Bergeron, President, and a number of volunteers from St. Margeurite d'Youville Parish set out to do what they could to help out. Today, CERCLE MISSIONNAIRE de la VALLEE collects over 60 tons of goods and medical supplies from local donors and ships the lot twice a year to Sister Therese. Besides providing assistance to Haiti , CERCLE MISSIONNAIRE also sends material to Moosonee and has a working relationship with the other two food banks in Valley East , Good Neighbours and St. Vincent de Paul. When donations come in, the volunteers check them out thoroughly to make sure that any repairs are completed before packing them in boxes, ready for shipping. With the permission of donors, some of the items are put up for sale in the impressive flea market section of the building. This is to raise money which is then used to purchase medical supplies and help pay the expenses of the building operation. Georgette tries to get into schools as often as she can to create awareness of the poverty in Haiti . She also speaks to CWL, Confirmation Groups and other community minded organizations. Most of the donations come to the group via word of mouth. Georgette will also accept cash donations and indicated that all donations of $20 or more will be given a tax receipt. CERCLE MISSIONNAIRE de la VALLEE originally ran out of the old Our Lady of Fatima school building on Percy Street in Blezard Valley . In January 2004, the organization moved to their new, much larger location at the former public works building on Desmarais Road in Val Therese. The space is much larger and enables the volunteers to have enough space to display items for their weekly flea market and do their packing for the next shipment to Haiti . Every Wednesday, from 12 noon to 4 p.m. CERCLE MISSIONNAIRE de la VALLEE opens up their building for one of the largest a flea markets you can find in the entire district to help raise money to purchase supplies for the next shipment to Haiti. If you have any items to donate or would like to make a financial donation, just drop in to their new home in the old Public Works building on Desmarais road any Wednesday afternoon from 12 noon to 4 p.m. or call 969-2192 for more information. 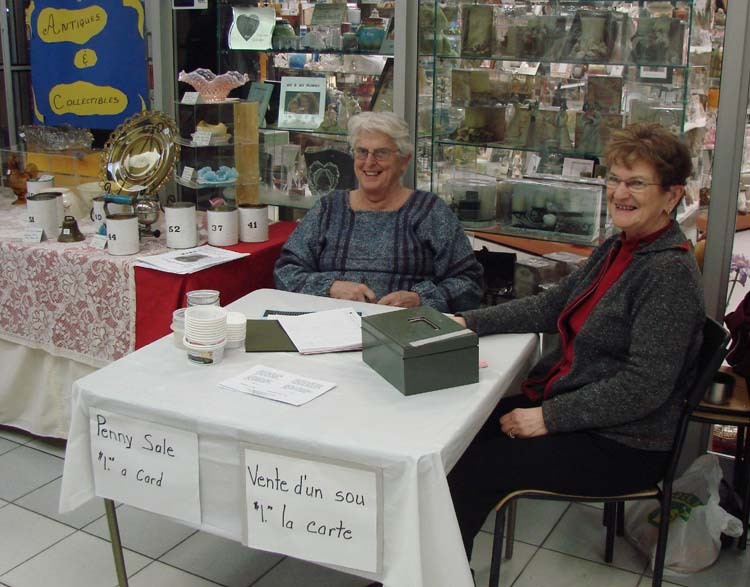 In the photo below, Georgette Bergeron is shown on the left, with Jacqueline Cormier, selling tickets to the penny table. The Hanmer Valley Shopping Centre is pleased to be able to help out our education institutions whenever we can. 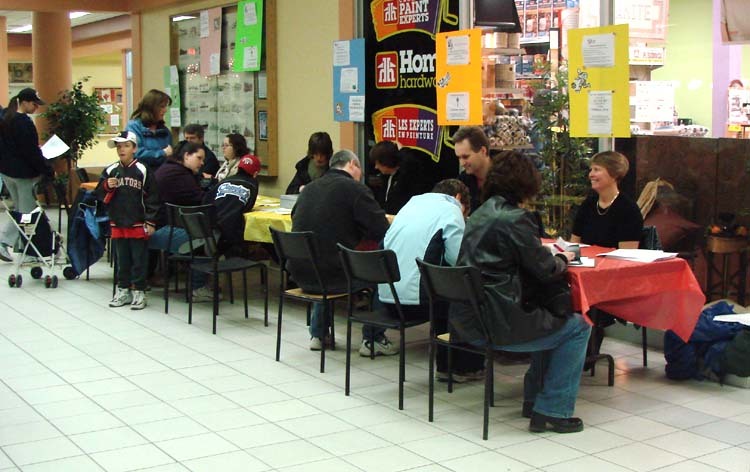 The mall is often used by post-secondary school students to conduct surveys and do projects that are part of their program of study. Two new residents of Valley East who moved here from Marathon , Rene and Diane Brunelle, shown on the right in the photo, were more than happy to give up a few minutes of their time recently to help out a group of Laurentian University students with one of their projects. The students, from the left: Melissa Kirkey, Danielle Roy and Courtney Conaty, are all in the 2nd Year of a four-year Bachelor of Commerce Program. One of their major assignments for the year is the development of a new product that could be brought to market. In order to determine the viability of their product they are required to conduct interviews with potential customers to gather information that will be beneficial in their marketing efforts. They decided to conduct their survey at the Hanmer Valley Shopping Centre. The product created by the group was a “pack of greeting cards designated to a particular person and containing all the cards that would be needed for the occasions throughout the year”. Two other members of the group, Justin Sawicz and Michelle Goneen were present for the photo. The entire group will be appearing on The Learning Clinic, a local education radio talk show on CKLU 96.7 FM on Monday, November 17 at 6:00 p.m. to share their thoughts about the Commerce Program at Laurentian. Any secondary school student who might be interested in enrolling in this program in the future should listen to the show or pick it up on their computer off the web site at www.cklu.ca . As part of their program, students enrolled in the Laurentian University Nursing Programs are required to spend a number of hours in community and clinical settings. 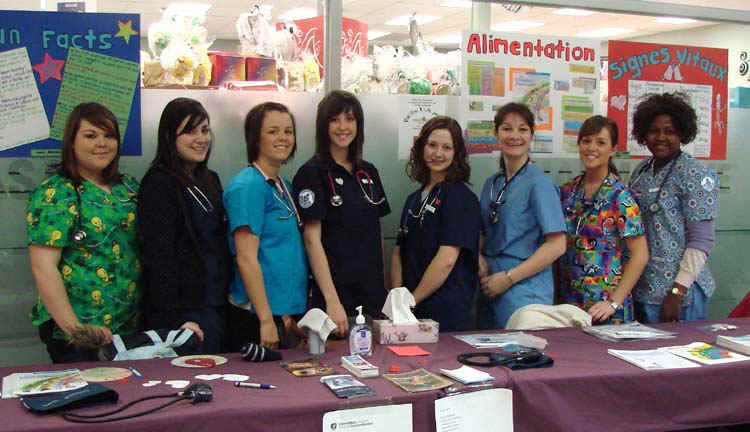 On February 11, 2008, seven of the students, under the supervision of Lynn Aubuchon, third from the right in the photo, conducted a Vital Signs Clinic at the Hanmer Valley Shopping Centre. Shown in the photo, from left to right, are: Carrie-Ann Castilloux, Marie Rose, Dominique Leroux, Renee Bertrand, Nathalie Lebeau, Lynn Aubuchon, Charlene Quesnel, and Fatima Sankoh. The girls are all part of the 4 year French language nursing program at the school. The Hanmer Valley Shopping Centre is pleased to offer space for Minor Sports organizations to conduct their annual registrations. Our mall is open seven days a week and closes at 9 p.m. every weeknight, providing a level of convenience which is unavailable at most venues. For more information about setting up your registration tables, contact Robert Kirwan, Manager of Marketing & Public Relations at 969-7215. Registration was scheduled to begin at 5:00 p.m. on Friday March 23, 2007, but the people begin lining up almost a half hour early to sign up for the 2007 soccer season with the Valley East Minor Soccer Club. Registrations will continue on Friday, March 30 (5 to 8); Saturday, March 31 (10 to 4); and Saturday, March 7 (10 to 4). Once all of the registrations are taken and the teams formed, play is scheduled to begin the week of May 29, 2007. All games are played Monday through Thursday with the adults playing on Sunday evening as well. Make-up games are played on Fridays. The Valley East Soccer Tournament is scheduled for the weekend of June 22, 23 and 24. Playoffs are tentatively scheduled for August 7 to 12 inclusive with final playoff games occuring during the weekend of August 10 to 12. If you require any further information contact the Soccer Line and leave a message at 969-8497. Registration totals for minor baseball in Ontario always increase whenever the Toronto Blue Jays do well in spring training and early in the season, so it was no surprise to Debbie St. Jean, President of the Valley East Minor Baseball Association to see positive numbers during their first two weekends of registration. Debbie is shown in the middle of the photo taking one of the many registrations that came in during her time at the mall. Sitting to her left is Joy Jokinen, Director of Operations for VEMBA, and to her right is Dan Beaudry, Vice President. When the first pitch is thrown the first week of June, there will be over 200 boys and girls from 4 to 20 years of age playing baseball on fields throughout Valley East . With 12 to 13 players on a team, it is certain that everyone will get plenty of playing time during the summer season. This is important since the VEMBA prides itself on being a developmental organization, with the top priority being to help young players develop the skills necessary to better enjoy the game. It’s all about fun at the house league level. Another popular event, the Blue Jays Clinic will be held during the summer, featuring trainers from the Toronto Blue Jays working with young players from the Valley East Minor Baseball Association. The final weekend for registrations will be held at the Hanmer Valley Shopping Centre on Saturday, April 26 and Sunday, April 27 from 12 noon to 4 p.m. each day. All boys and girls wishing to play baseball this summer should make sure to register on those days. For more information you can always go to the web site that you can access at www.vemba.ca or you can call the main office line at 897-5959. Fern Legault has lived in Valley East all her life. So it is not surprising that she wanted to do something special to celebrate our Centennial Year in 2004. Her project, however, will live on forever in the Hanmer Valley Shopping Centre in a huge display case which will provide thousands of visitors with pleasant memories. Fern, who has resided in the same house in Val Therese for the past 33 years, began working on the quilt in July of 2004. She put in over 2500 hours for the next five months, painstakingly cutting and gluing and sewing pieces of fabric on to the 30 square foot quilt. By the time she finished, a total of 48 different key sites in Valley East were mounted on the quilt. Fern and her husband, Paul, will be celebrating their 40th wedding anniversary on June 19, 2005. They raised three children during that time: Nicole (33), Paul Jr. (35), and Suzanne (39). Many people will remember Fern by her maiden name of Blais, since her father operated Blais Body Shop on Radar Road for many years. As a matter of fact, with the exception of the body shop, and the old Woodland Hotel, all other 46 sites on the quilt are still in existence and still going strong today. Once Fern collected the photos she would use for the quilt, her and Paul had to make a trip to Cambridge to purchase the proper material in colours which would match the photos. It was a labour of love that will provide many wonderful memories for visitors to the shopping centre. We all thank Fern for this magnificent gift. 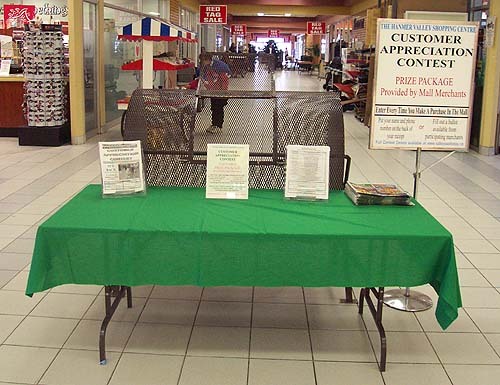 Customer Appreciation Contests are always popular among the shoppers who visit the Hanmer Valley Shopping Centre. Shoppers are usually encouraged to enter by filling out a ballot and leaving it in the drums which are generally located just outside the entrance to Food Basics, Hanmer Home Hardware and Valley Plaza Pharmacy at the northwest corner of the mall. The other drum, shown below, is usually just outside Billie Jeans. 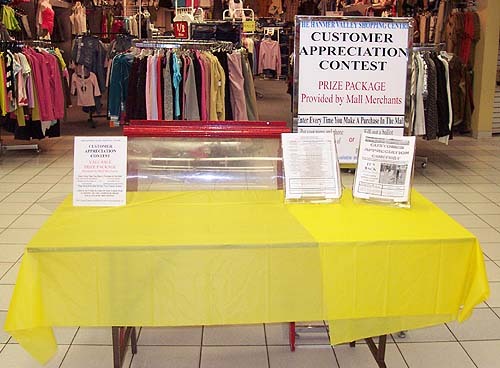 The prize packages consist of hundreds of dollars of gift certificates or merchandise donated by mall merchants. Education Week is a time set aside each year to take a few moments to recognize the important place learning has in our life. It is also a chance for us to recognize the accomplishments and achievements of our youth. This year, many schools from Valley East will set up displays of student work at the Hanmer Valley Shopping Centre. It is important for our children to see that we are interested in their school work, so we should all spend some time visiting the mall to look at the displays. Even if your own child’s school is not participating, you should comment on how nice it is to see the work of other children. It will be a motivation for your child to try harder in his own situation. We should also, as adults, take a few minutes to reflect upon our own "learning program". Learning is a life long process. You never stop learning. So what are you doing to make sure that your learning is helping you become a better person. Go to the library. Pick up that book you got for Christmas. Spend some time surfing the internet on interesting topics. Do it now! 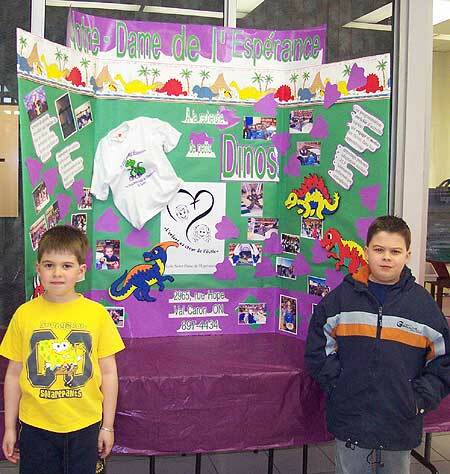 Julien Mailloux, a Grade One student at Val Caron's Notre Dame de L'Esperance, and his brother, Justin, Grade 4, take time to look over the display put up by their school at the Hanmer Valley Shopping Centre during Education Week. Local schools have been invited to set up displays all year long in the mall in order to provide more public awareness about the accomplishments and achievements of our young citizens. 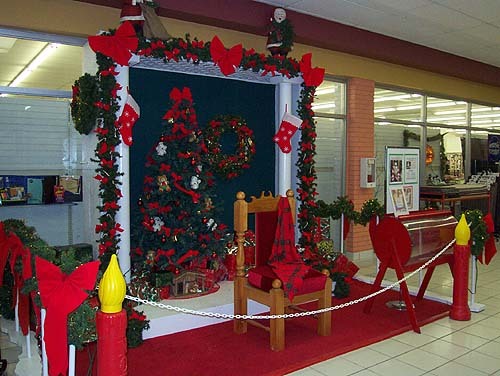 The chair at the Hanmer Valley Shopping Centre will be filled by Santa Claus every weekend in December. Fridays from 6 p.m. to 8 p.m.
Saturdays from 10 a.m. to 4 p.m.
Sundays from 12 noon to 4 p.m.
During the final week before Christmas, Santa will be in the mall for some additional hours in order to give parents a chance to visit with their children. Each year, instead of bringing in a professional photographer to take pictures and sell them to parents, the Hanmer Valley Shopping Centre has decided to allow parents and grandparents to bring their own cameras and take as many photos as you would like. 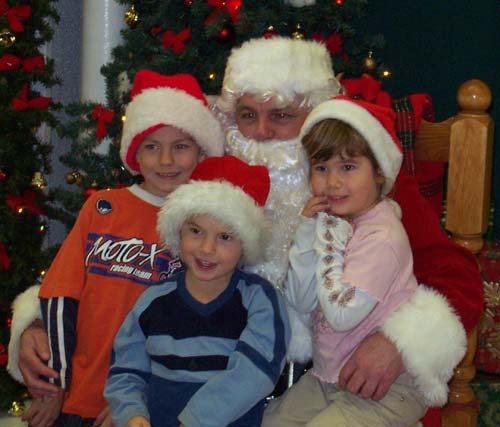 We know that it it nice to have a group photo with mom and dad along with Santa as well, so this means that you can end up with some great memories that will last a lifetime and not have to worry about paying the $15 or $20 for a professional photo. 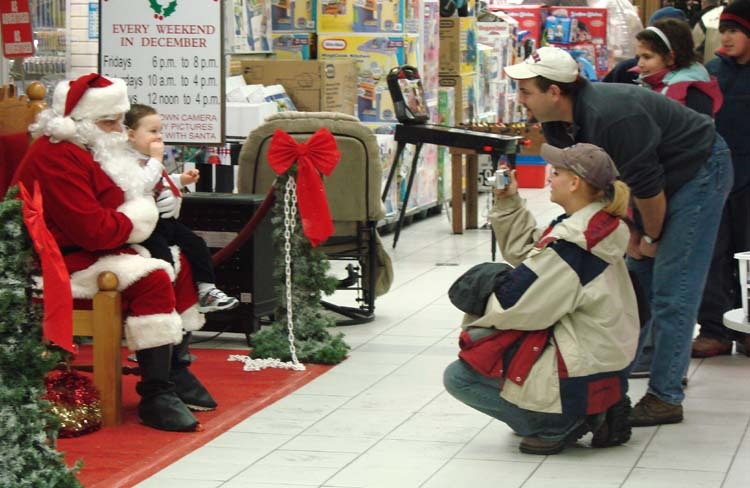 An unidentified young boy enjoying his candy cane sits patiently with Santa Claus while his parents take several photos in an effort to get the perfect picture to save forever. This is the second year that the Hanmer Valley Shopping Centre has instituted a policy which allows parents and grandparents to take their own photos with Santa. It was done in an effort to save money for parents who normally must purchase expensive packages from professional photographers in most malls. Judging by the positive feedback, this is a policy which is likely to remain in place at the mall for some time to come. 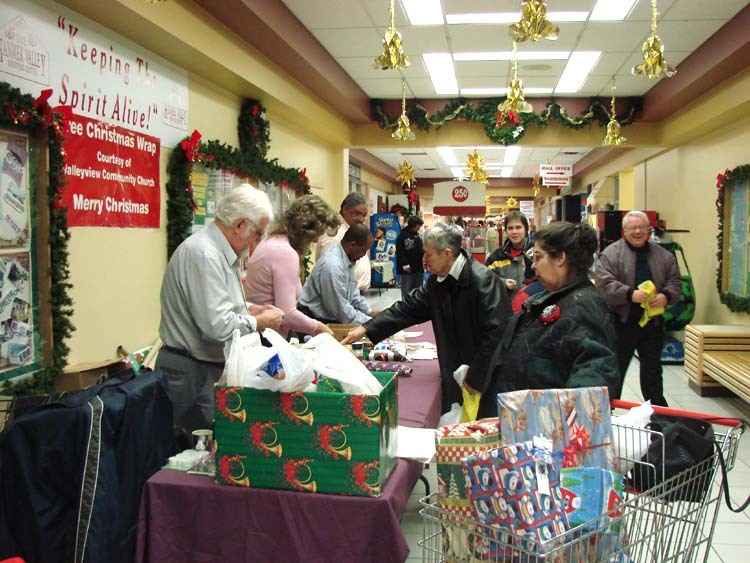 Every year, just before Christmas, The Valleyview Community Church sets up in the mall to provide free gift wrapping for shoppers. This is a much-appreciated service. 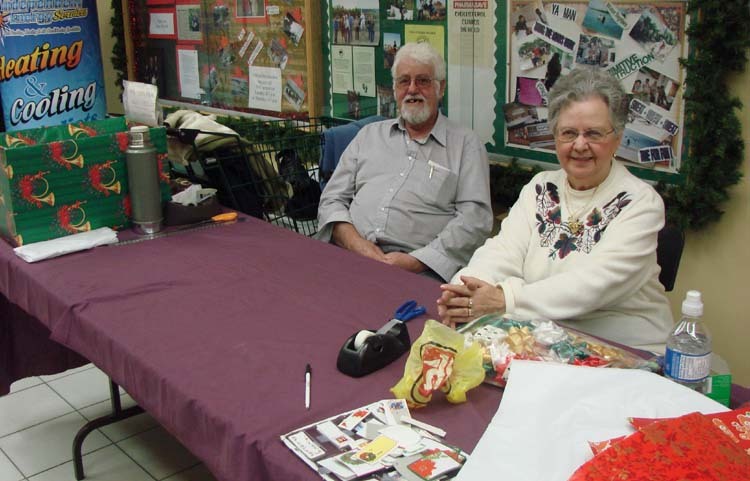 Lou Dotto, to the left in the foreground, spent a busy few days at the Hanmer Valley Shopping Centre wrapping holiday gifts for local shoppers. This was about the fifth year that the Valleyview Community Church has organized this free service for local residents. It is much appreciated by the busy, last-minute shopper. The gift wrapping is free, but many people donated an item of food for the needy to say thank you for the service. Here, Lou is shown with his wife Bernadette during a quiet moment. Karen Stenbraaten, on the left, and Kimberly Irving were also two of the volunteers from the Church who took part in the gift wrapping activity. The Hanmer Valley Shopping Centre is pleased to provide space as a drop-off depot for the local Food Banks. 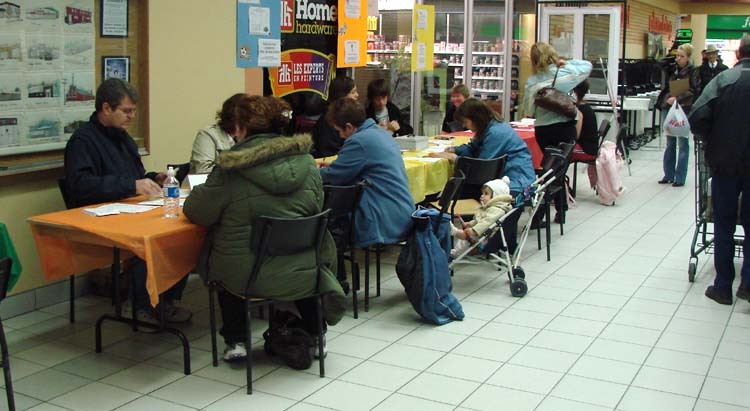 Being open seven days a week makes this a convenient location for residents wishing to donate to the needy. The Good Neighbours Food Bank in Hanmer, run by Anne Unwin and her hard-working group of volunteers, have had a challenging time recently keeping up with the demand for food from needy families. Where they usually fed approximately 50 families per month, they are now seeing up to 90. 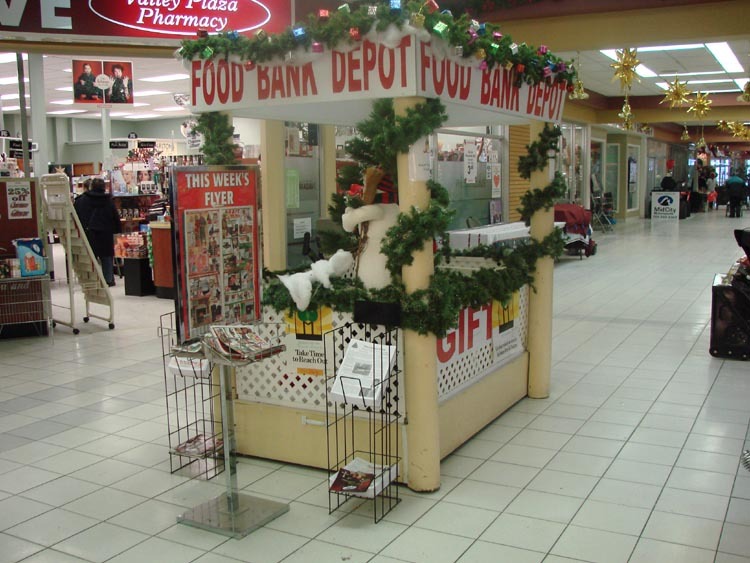 In order to provide a convenient place for local residents to donate food and supplies, the Hanmer Valley Shopping Centre has decided to keep the Food Bank Depot in place all year long. Anyone who wishes to drop off food or gifts for the Good Neighbours Food Bank is asked to simply leave the items in the Food Bank Depot which will be located at the entrance just outside Food Basics. If you wish to donate money, just leave it with the one of the sales clerks at Valley Plaza Pharmasave. 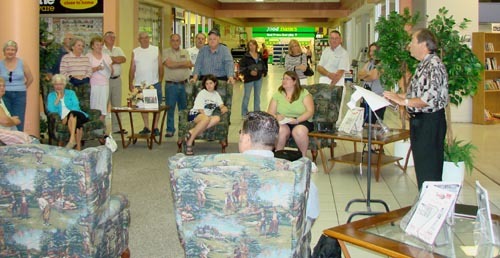 From time to time the mall is used as a central place for residents of the community to meet with celebrities, These events are usually sports related or are sponsored by the municipal organizations. 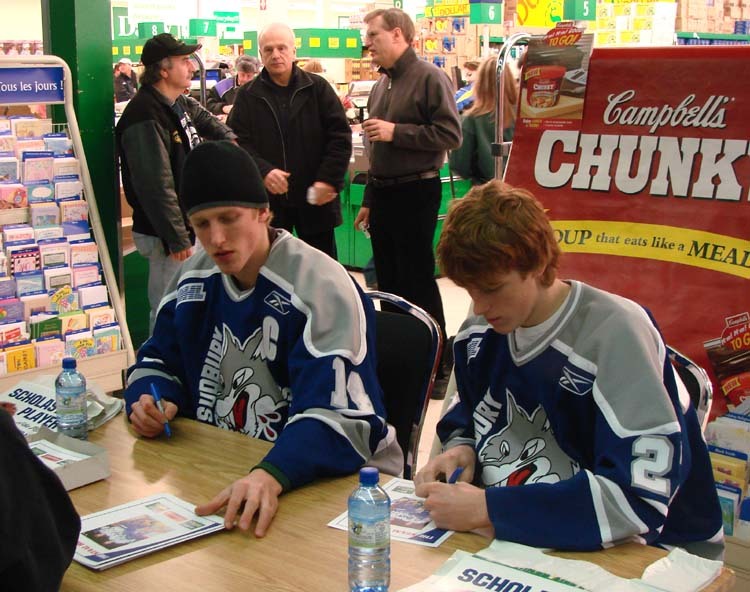 Marc Staal, Captain of the Sudbury Wolves and destined to join his other two brothers, Eric and Jordan in the NHL for the 2007-2008 season, is shown at the end of an "exhausting" autograph session with his younger brother, Jared on the right. The two talented players had just finished an hour of continuously signing posters, jerseys, hats, sticks, etc. as fans of all ages spent a few brief moments that they will be able to talk about for the rest of their lives. Blaine Smith, Vice-President of Hockey Operations, is standing on the far left in the photo. Blaine Smith, who is a graduate of the Sports Administration program at Laurentian University, has served in just about every role possible on the staff and is currently celebrating his 25th year with the Sudbury Wolves. Beside Blaine is Bill Nurmi, Territory Development Manager for Campbell Soup Company Ltd., one of the corporate sponsors of the Sudbury Wolves. The third gentleman in the back row is Ken Desjardins’ owner of Desjardins’ Food Basics, who along with Gary Doyle, owner of Doyle's Food Basics, has been a major corporate sponsor of the Sudbury Wolves for three years and is the team's Official Grocer. Marc Staal, on the left, was born on January 13, 1987. The 20 year old who wears #14 stands in at a solid 6' 4" and 205 pounds, making him a sure bet for a contract with the New York Rangers in the fall of 2007. The Rangers drafted Marc 12th overall in 2005 after the Sudbury Wolves picked him in the 1st round of the midget entry draft in 2003. He is a left-hand shooting defenseman who has the frame to battle with the tough stars of the NHL. Marc has already had a story-book hockey career, winning two gold medals with Team Canada at the World Junior Championships and received the top defenseman award in 2006. Jared, on the right in the photo, was born on September 21, 1990 and hails from Thunder Bay. The 16-year old is in his first season with the Wolves and already stands in at 6' 2" and 180 pounds. He now plays right wing, shoots right and wears #27. Jared was a first round pick by the Wolves in the midget entry draft of 2006, playing last year with the Thunder Bay Kings Midget AAA. He is eligible for the 2008 NHL draft and is expected to see a lot of playing time during the 2007-2008 season. 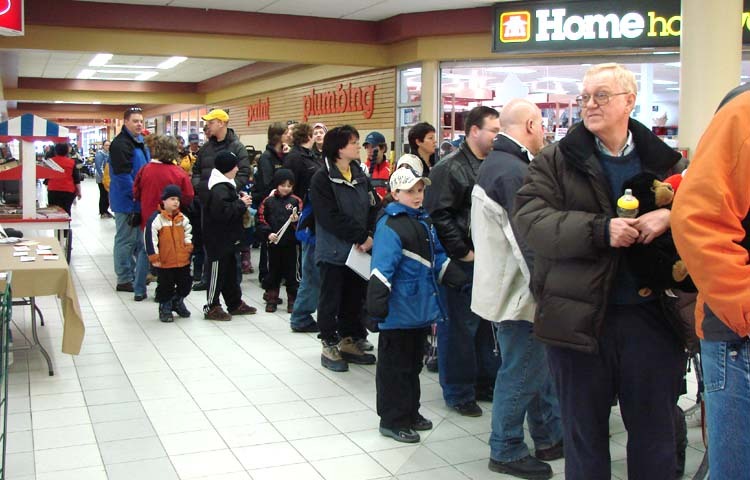 The crowd, partly shown in the photo below, began lining up forty minutes before the autograph session was scheduled to begin and gave the Staal brothers a hearty ovation when they arrived. "Good morning citizens, friends, and members of the media. Thank you for coming to the Hanmer Valley Shopping Centre this morning to witness my decision to declare my candidacy for Mayor of this great city of ours." 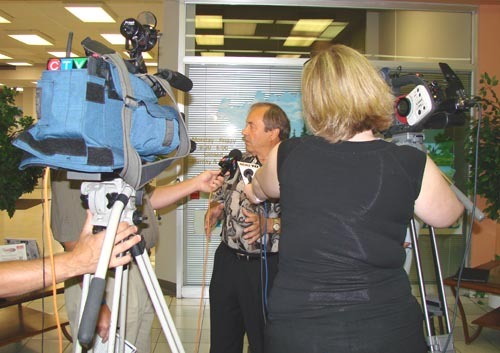 With those words, on Thursday, July 27, 2006, one of the most colourful political leaders to ever come from the Sudbury region announced that his name would be on the ballot in the November 13, 2006 municipal election. 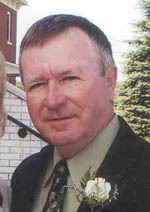 Rodriguez began his political career in 1967 - a career which includes acting as the Member of Parliament for the federal Nickel Belt Riding from 1972 to 1980 and again from 1984 to 1993. During his time in federal politics, John established a strong network of contacts in both Ottawa and Toronto. His knowledge of how the political system operates at the upper levels will serve as one of his strongest assets as leader of the City of Greater Sudbury. "It is an understatement to say that there is a mood of dissatisfaction about how our city functions," he added. "I sense a collective disillusionment by many citizens over unfulfilled promises made at the time of amalgamation. As a result large numbers of citizens, primarily from outside the core city, feel excluded and alienated within the City of Greater Sudbury. This is one of the major concerns that has persuaded me to make today's decision. I have tremendous optimism and hope for our city and I believe that I have positive ideas that will inspire our communities and our neighbourhoods to work together in developing a sense of inclusivity in the City of Greater Sudbury." As part of his opening address to dozens of onlookers, Rodriguez emphasized the following, "I believe that municipal government must also concern itself with the quality of life for its citizens. Therefore, I will ensure that the recreational needs and cultural aspirations of our citizens receive paramount attention in my term of office. As Mayor, I will support economic development, led by the private sector and supported by the City. As Mayor, I will work with city Council, city staff, provincial and federal parliaments to build and expand our community's strengths in mining, education, tourism and health care. Council will have a role, along with our community groups and the business community to see that money committed to economic development is spent fairly and wisely to benefit all parts of our city and in full view of our citizens." Members of the media welcomed John Rodriguez's candor and openness, firing all kinds of questions during the scrum that followed his announcement. Once again he reiterated his commitment to "work to ensure that citizens, no matter where they live in the City of Greater Sudbury, feel included. There will be no "area specific" service charges." 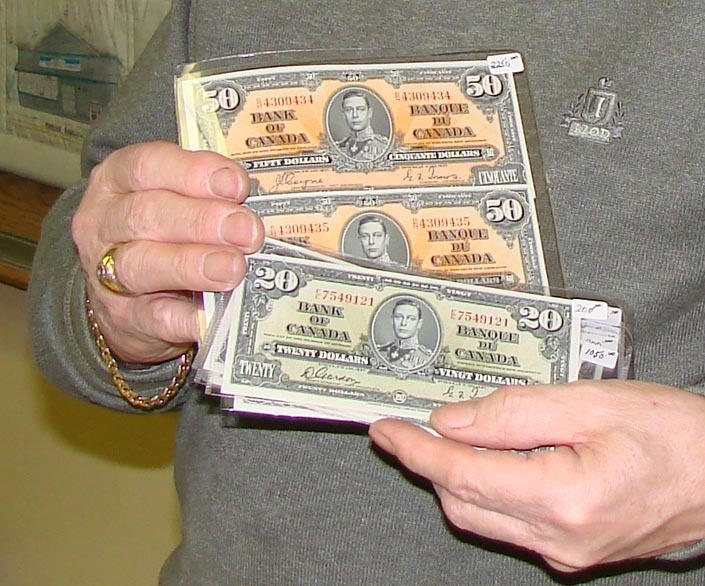 Many local residents have taken up coin collecting as a hobby. 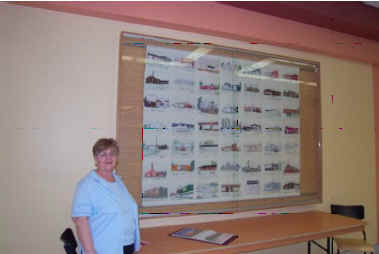 The Hanmer Valley Shopping Centre provides space for John Brown to set up his display and meet with these collectors every month. The Hanmer Valley Shopping Centre wants all local residents to consider us to be their "community centre". We have set up comfortable sitting areas throughout the mall for the convenience of our shoppers and we encourage them to meet their friends during the day for a coffee or a chat. The Centre Court is our most popular meeting place. 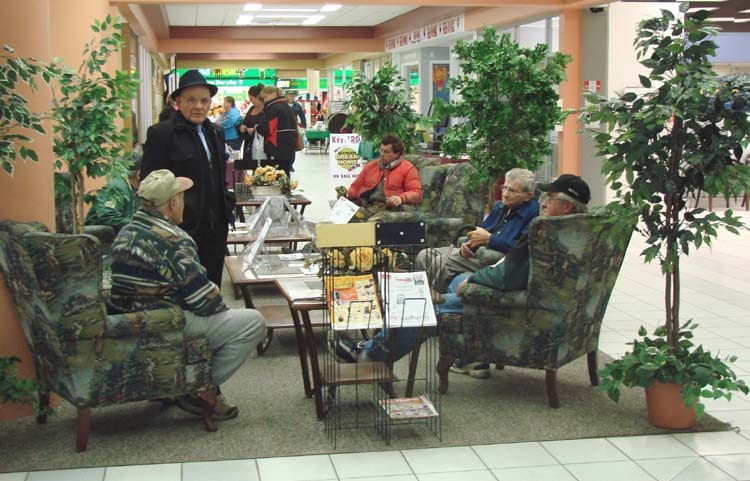 The first Mayor of Valley East, Mr. Raymond Plourde, second from the right, is shown having a conversation with several of his friends during one of the "Afternoon Council Sessions" that are held daily in the Centre Court Sitting Area at the Hanmer Valley Shopping Centre. The gentlemen enjoy their afternoon conversations with friends and acquaintances as they discuss everything under the sun. The mall has developed a very community-friendly image over the past couple of years, making this a true community centre for young and old alike.